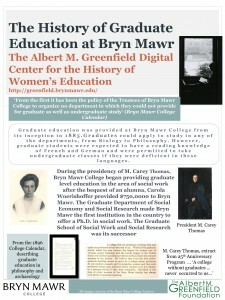 The Albert M. Greenfield Digital Center Celebrates the History of Graduate Education – check out today’s poster session! The poster is currently being displayed in Thomas Great Hall along with posters from current graduate students. I will be available to talk about this poster tonight at 5.30pm along with the graduate students at a special event to be held before the talk by Professor James Wright of the Archaeology Department on ‘Graduate Education Through the Years’. On Friday there will be a networking reception with current graduate students and alumnae/i and for this I have prepared a series of images which will be projected while the event is happening. This includes images of former graduate studies deans, students and facts about graduate education at Bryn Mawr College that you may be unfamiliar with. Be sure to check it out! The event is happening at 5pm in the Ely Room of Wyndham. This entry was posted in Conferences & Events, News and tagged Connecting the past with the present, Graduate education, Reflecting on the history of women's education by Jennifer Redmond. Bookmark the permalink.